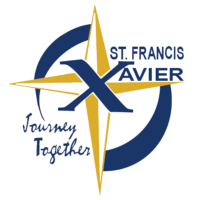 Students may wear the "old" or the "new" St. Francis Xavier School logo/monogram on their school uniform polo shirts for the 2018-2019 school year. They also may wear any color of non-marking shoes for gym class. All students are expected to come to school and leave school properly dressed following our St. Francis Xavier School Dress Code. If your child does not comply with the school dress code, he/she will be issued a Dress Code Violation. Three Dress Code Violations will result in an after-school detention. In addition, a parent may be called upon to bring appropriate clothes in order for the student to return to class. The school administration reserves the right to rule on final interpretation of any and all dress code categories. Kindergarten students are required to wear uniforms. They should follow the dress code listed below. Jumpers Schoolbelles plaid v-neck jumper, length must reach top of the knee. Shirts/Blouses Schoolbelles-monogrammed polo shirt in white, yellow, gray or light blue - long or short sleeve. Round or pointed collar blouse in white - long or short sleeve. (Shirts/Blouses are to be tucked in at all times.). Schoolbelles-monogrammed, banded-bottom polo shirt in white, yellow, gray or light blue - long or short sleeve (Does not need to be tucked in. Belt is not required when wearing banded shirt). Pants/Slacks/Shorts Schoolbelles navy twill slacks K-1 style 5204; K-8 style 3261, 3264, 3266, 8264, 8365 or Schoolbelles walking shorts K-1 style 3260; K-8 style 3267, 8267. Students in kindergarten and first grade may wear shorts and pants with elastic waists purchased through Schoolbelles. No shorts are permitted between November 1 and April 1. Skirts Schoolbelles plaid pleated or kilt style skirt/skort, length must reach top of knee. Shirts Schoolbelles-monogrammed polo shirt in white, yellow, gray or light blue - long or short sleeve (Shirts are to be tucked in at all times.) Schoolbelles-monogrammed, banded-bottom polo shirt in white, yellow, gray or light blue - long or short sleeve (Does not need to be tucked in. Belt is not required when wearing banded shirt). Pants/Slacks/Shorts Schoolbelles navy twill slacks K-8 style 3261, 3264, 3266, 8264, 8265 or Schoolbelles walking shorts K-8 style 3267, 8267. No shorts are permitted between November 1 and April 1. Skirts/Skorts Schoolbelles navy pleated or kilt style skirt/skort, length must reach top of knee. Shirts Schoolbelles-monogrammed polo shirt in white, yellow, gray, light blue or navy - long or short sleeve (Shirts are to be tucked in at all times.) Schoolbelles-monogrammed, banded-bottom polo shirt in white, yellow, gray, light blue or navy - long or short sleeve (Does not need to be tucked in. Belt is not required when wearing banded shirt). Pants/Slacks/Shorts Schoolbelles navy or khaki twill dress slacks K-8 style 3261, 3264, 3266, 8264, 8265 or Schoolbelles walking short K-8 style 3267, 8267. No shorts are permitted between November 1 and April 1. Pants/Slacks Schoolbelles navy dress slacks K-1 style 5204; K-8 style 5202, 5203, 8302 or Schoolbelles walking shorts K-1 style 3260; K-8 style 3268, 3282, 8268. Students in kindergarten and first grade may wear shorts and pants with elastic waists purchased through Schoolbelles. No shorts are permitted between November 1 and April 1. Shirts Schoolbelles-monogrammed polo shirt in white, yellow, gray, light blue or navy - long or short sleeve (Shirts are to be tucked in at all times.) Schoolbelles-monogrammed, banded-bottom polo shirt in white, yellow, gray, light blue or navy - long or short sleeve (Does not need to be tucked in. Belt is not required when wearing a banded shirt). Pants/Slacks Navy or khaki dress slacks or walking shorts - traditional dress, Dockers-style uniform pants/shorts. Shorts are not to be shorter than two inches above the knee. No shorts are permitted between November 1 and April 1. SHOES: Sturdy, solid, dark-colored BLACK or BROWN closed shoes - Heels not to exceed 1 inch. Saddle shoes and plain Sperry's are acceptable. SOLID BLACK athletic shoes are permitted. No colored logos, stitching or shoelaces are permitted. No high-tops, sandals, moccasin-style, clog-style (Crocs), jellies or boots permitted. Shoes must be tied at all times. SOCKS/TIGHTS: Girls: Solid navy, black, white or gray without emblems or trim, 6th-8th grade may add khaki socks. Boys: Solid navy, black, white or gray without emblems or trim, 6th-8th grade may add khaki socks. Students must wear socks/tights at all times. Socks must cover ankles and MUST BE VISIBLE. Leggings may be worn under uniform skirts from Nov. 1 - April 1. Leggings are to be the same colors as tights mentioned above. SWEATERS/VESTS/JACKET: Navy or white round-neck cardigan, navy v-neck or pull-over cardigan, vest, or Schoolbelles fleece jacket. Sweaters are not to have hoods or belts. BELTS: Solid, dark standard belts required with slacks or shorts if there are belt loops. No studs or decorations are permitted on belts. Belt is not needed if wearing Schoolbelles banded shirt. HAIR ACCESSORIES: Girls: Should be small and appropriate for school (Plain navy, white, black, brown, gold, or uniform plaid). JEWELRY: One pair of SMALL studded pierced earrings for girls on the ear lobe. One small religious cross or medal on a chain. Plain, silent wristwatches are acceptable (no smart watches). Gold T-shirt with St. Francis Xavier logo. Navy regulation shorts - shorts made from navy sweatpants that have been cut and hemmed, navy sweatpants/ St. Francis Xavier spirit wear mesh shorts with school logo. No shorts permitted between November 1 and April 1. Shorts are not to be shorter than two inches above the knee. Inexpensive non-marking tennis shoes are to be worn in gym- to be left at school for indoor use only. Gray T-shirt with St. Francis Xavier logo. Navy regulation shorts - shorts made from navy sweatpants that have been cut and hemmed, navy sweatpants/ St. Francis Xavier spirit wear mesh shorts with school logo. No shorts are permitted between November 1 and April 1. Shorts are not to be shorter than two inches above the knee. Inexpensive non-marking tennis shoes are to be worn in gym - to be left at school for indoor use only. No logos, symbols, or trim on any uniform piece of clothing is acceptable. Clothes are to be worn in the manner in which they were intended. Schoolbelles "uniform styles only" for all uniform apparel. HAIR: Styles should be neat and appropriate for school. Hair styles should not be distracting. The natural hair color may NOT be altered in any way. Boys: Hair must be cut above the eyebrow, cut around the ear and cut above the collar and neatly kept. Boys must be clean shaven - no long side burns. MAKEUP: Make-up, nail polish or artificial nails are not permitted. UNDERGARMENTS: Only plain, white t-shirts are permitted. PANTS/SLACKS: Schoolbelles girl’s slacks- K-1 style 5204; K-8 style 3264, 3261, 3266, 8265, 8364, as purchased at Schoolbelles. Schoolbelles boys' trousers-K-1 style 5204; K-8 style 5202, 5203, 8302, as purchased at Schoolbelles. Skinny, oversized, baggy, drooping, trendy and/or pants with frayed hems, pants with holes, pants with pockets on the pant leg, pants with rivets, jeans-style stitching or low-rider pants are unacceptable. Denim, stirrup, velvet, leggings, stretch pants or any pants with stretchy material (spandex/lycra/stretch knits) are unacceptable. SHORTS: Schoolbelles girl’s K-1 style 3260; K-8 style 3267, 8267.Schoolbelles boy’s K-1 style 3260; K-8 style 3268, 8268, 3282. May not be worn between November 1 and April 1. ST. FRANCIS XAVIER SWEATSHIRTS: May not be worn during the school day with the uniform. Schoolbelles “uniform-styles only” for all uniform apparel. On School Spirit Days, students are permitted to wear official St. Francis Xavier School Spirit Wear. They may wear St. Francis Xavier T-shirts or sweatshirts that have been distributed to the students through the school (choir, drama, sports, etc. ), or they may wear their gym uniform or they may wear their school uniform. CYO uniforms that need to be returned at the end of the sports season may not be worn to school on School Spirit Days. Sleeveless SFX tops must have a shirt with sleeves underneath. Tennis shoes may be worn with the spirit wear or gym clothing, but must be neat, clean and laced. Shorts may not be worn between November 1 and April 1. Make-up, nail polish or artificial nails are not permitted. On casual dress/special occasion days, students are to wear attire which reflects the Christian values of modesty, respect for the individual, and respect for our Catholic tradition, cleanliness and neatness. On special occasion dress down days (sports days, St. Patrick Day, etc. ), students will be given the opportunity to wear clothes reflecting the occasion. Guidelines will be announced before the event. All general dress code regulations apply: Shirts must have sleeves - Skirts and dress length must reach top of knee. Shorts length is equal to Schoolbelles short length. No sandals, moccasin-style, clog-style (Crocs), or jellies permitted. Shoes must be tied at all times - Students must wear socks/tights with their shoes. Tight-fitting pants/jeans/capris/shorts, etc. should be worn with a long shirt, sweater, or skirt that comes down to the fingertip length of the thigh to provide adequate coverage. No rips, tears or writing on the back of pants permitted.Please see Pants/Slacks section under COMMENTS. Shorts may not be worn between November 1 and April 1. Leggings under uniform skits may be worn form Nov. 1 - April 1. Make-up, nail polish or artificial nails are not permitted.